Sweet Mountain Farm’s entire operation is exclusive to certified Russian honeybees. The breeding stock comes from Manley Bigalk, Bob Brachman, Steven Coy, Harry Fulton, and Ronnie & Austin Smith. Selected for the resistance to Varroa and tracheal mites, Russian bees exhibit hygienic behavior as well as cold hardiness. Frequently we see our Russian bees in flight on 40 degree days. 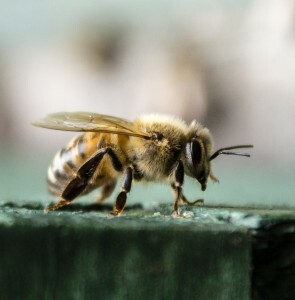 Another unique quality of Russian bees is its ability to quickly adapt to environmental changes. Wisconsin honey bees will average 64 lbs of honey per colony yet it is not unusual for a Russian colony to produce 100 lbs. Russian Bees require a different management style than other bee breeds. At SMF we choose to raise disease resistant Russian bees without the use of pesticide or miticide. The island location is unique keeping the bees isolated from potentially toxic soil and water. They know it in their own way, not in our way.